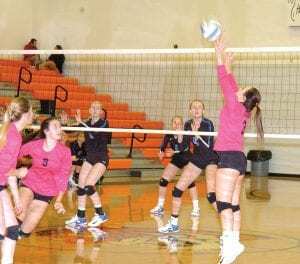 The Lady Tigers struggled at home dropping a pair of 3-0 matches. The Lady Tigers were defeated by Redfield/Doland on Monday after falling to Timber Lake on Saturday. The Lady Tigers could not keep up with a tall Redfield/Doland team and lost 25-16, 25-8, 25-20. “We started out well,” said coach Rose Henderson, “but we lost our focus for a while. We got it back, but it was too late. A big part of the problem was the Pheasant front line of 6’1” Addy Rozell, 5’11” Olivia Schantz and 5’9” Rylie Gall, who combined for 21 kills. “They were the taller and more physical team,” said Henderson. The Lady Tigers had just 12 kills. Hannah Gushwa scored a team-high three kills. The Lady Tigers came out flat in dropping a 25-14, 25-14, 25-21 match to Timber Lake. “We were tired from the long homecoming week and we played that way,” said Henderson. It was an avenging win for the Lady Panthers after the Lady Tigers knocked them off in the opening round of the Mobridge-Pollock Invitational in early September. The Lady Panthers used a balanced offense with Josie White, Lorenda Long and LaShae Nash combining for 23 kills. Loryn Schoelerman spread the ball around with 13 assists, while leading all servers with five aces. Sydney Maher handled the defense with 17 digs. Molly Lahren led the Lady Tigers with four kills, four aces and five digs. Alex Steiger dished 11 assists and defended with five digs. Gushwa and Hayley Borah added four kills each. The Lady Tigers have a week off to prepare for Ipswich coming to town on Monday. Ipswich is 6-9 on the season. Mobridge-Pollock and Ipswich are meeting for the 23rd time. The Lady Tigers have owned the series with an 18-4 all-time record. They have beaten Ipswich 16 times in a row. The last Ipswich win came in 2002. Redfield/Doland: Serving 61-64, 4 aces (Rylie Gall 11-11-2, Kennedy Fast 14-14-1); Setting 97-100, 27 assists (Fast 52-53-18, Hannah Kuehn 23-23-7); Hitting 60-74, 29 kills (Gall 21-24-8, Olivia Schantz 13-18-7, Addie Rozell 10-10-6); Digs 40 (Kuehn 10, Brianna Frankenstein 9); Blocks 7 (Rozell 2). Mobridge-Pollock: Serving 43-45, 3 aces (Hannah Gushwa 4-4-2, Jestice Talley 8-8-1); Setting 75-77, 11 assists (Alex Steiger 75-77-11); Hitting 69-84, 12 kills (Gushwa 6-8-3); Digs 18 (Emily Wientjes 6, Talley 3); Blocks 1 (Megan Zahn .5, Steiger .5). JV Match: Redfield/Doland 25-22, 25-12. C Match: Mobridge-Pollock 25-22, 25-19. Timber Lake: 70-74, 14 aces (Loryn Schoelerman 26-27-5, Josie White 10-12-4, Macey Bollinger 8-8-3); Setting 21 assists (Schoelerman 13, Morgan Ducheneaux 7); Hitting 25 kills (White 9, Lorenda Long 8, LaShae Nash 6); Blocks 4 (Nash 2); Digs 50 (Sydney Maher 17, Long 13, White 9). Mobridge-Pollock: Serving 38-41, 8 aces (Molly Lahren 7-9-4, Hayley Borah 6-6-2); Setting 74-77, 12 assists (Alex Steiger 67-68-11, Kaycee Redmond 4-5-1); Hitting 69-88, 12 kills (Hannah Gushwa 18-21-4, Lahren 13-16-4, Borah 10-11-4); Blocks 2 (Borah 1.5, Redmond .5); Digs 25 (Lahren 5, Steiger 5).